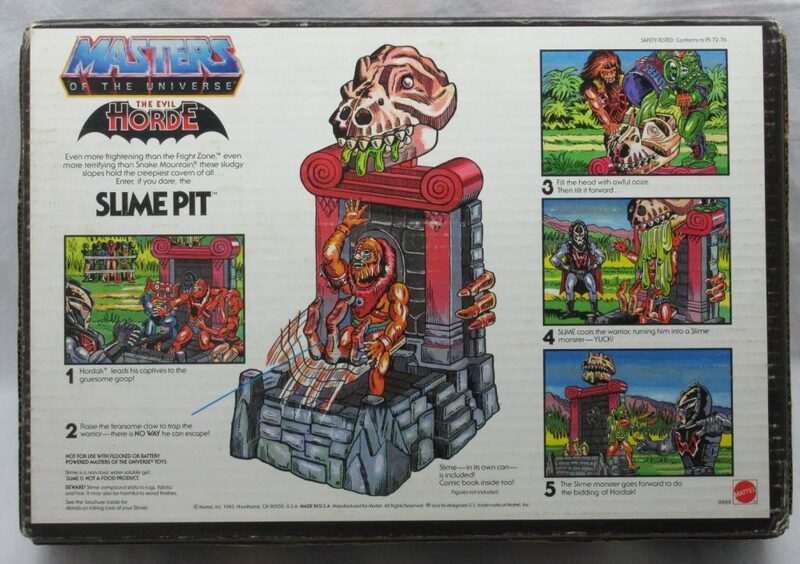 The Slime Pit was the second and final small playset released in the original Masters of the Universe toyline (the first was Point Dread, in 1983). 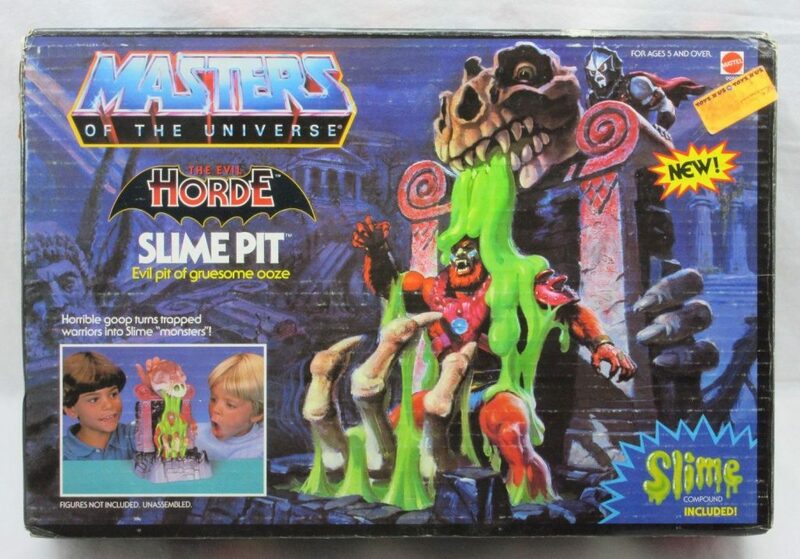 Of all the playsets MOTU had to offer, the Slime Pit perhaps packed the most punch for its size. It was all centered around one play feature, but it what a feature! 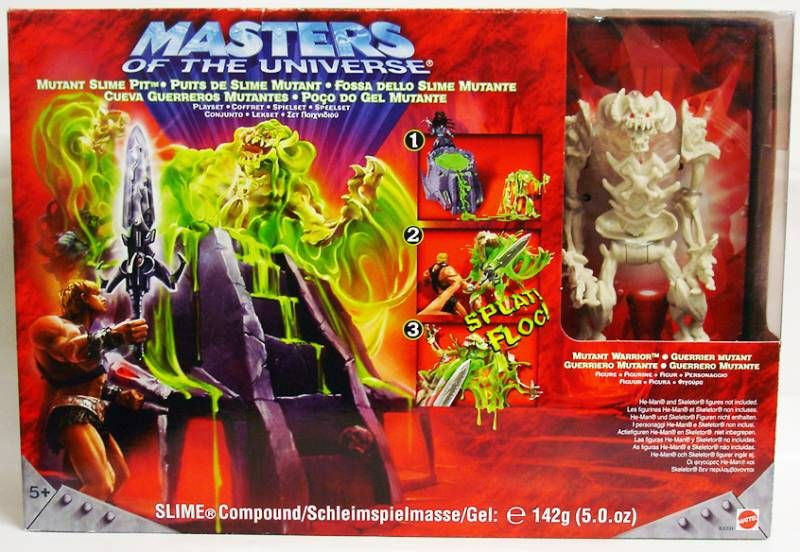 The Slime Pit was designed by Ted Mayer, from an idea that came out of the boy’s design group’s many brain storming sessions. 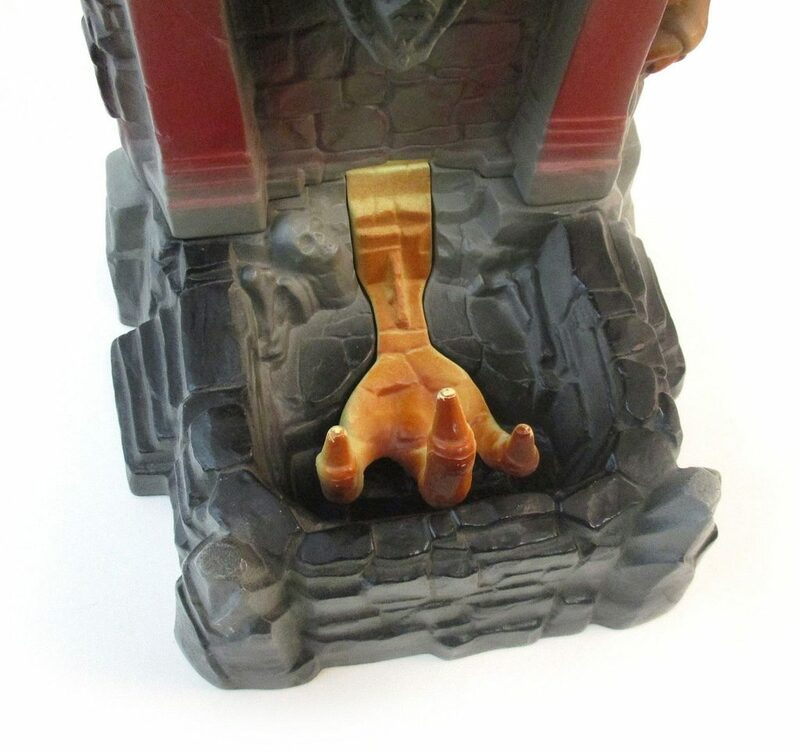 In the above illustration, you can see many of the hallmarks of the final playset are in place, including the grabbing hand in the front, the hand around the side and the scroll design near the top. 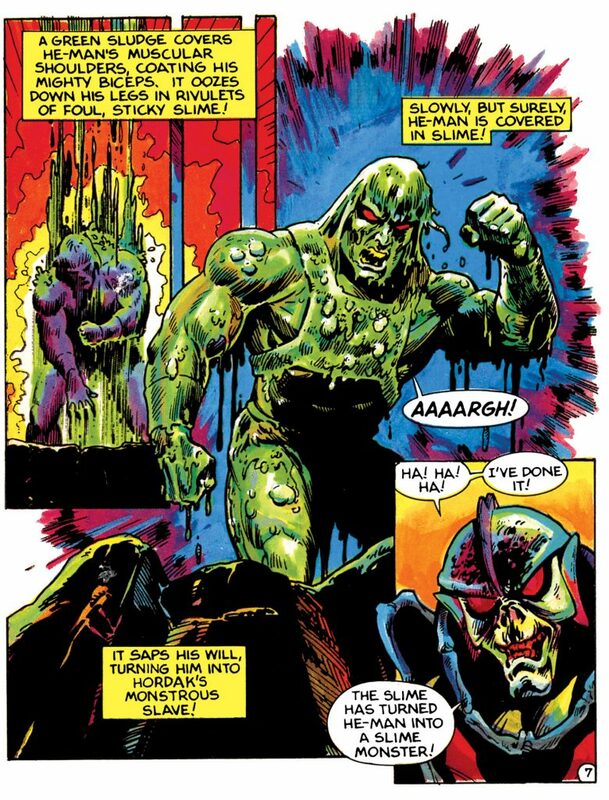 The slime-spewing head is wolf-like in this concept (a frequent theme in Ted’s designs, it seems), whereas the final version seems to have more of a dinosaur skull look. 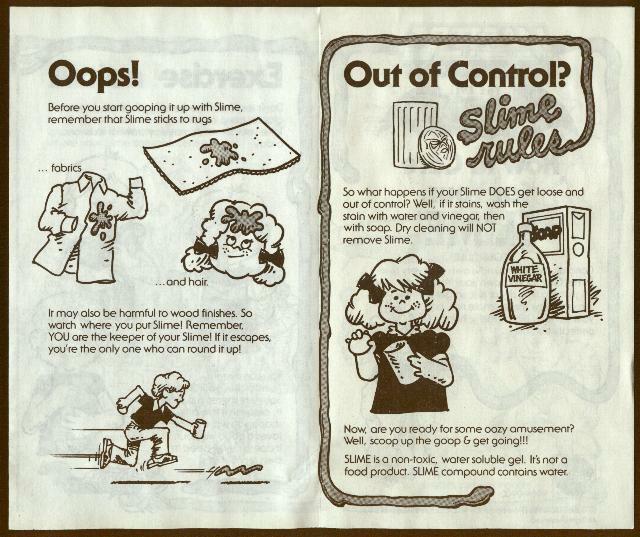 Mattel more or less invented slime as a commercial product, and it has been a popular seller since the late 1970s. 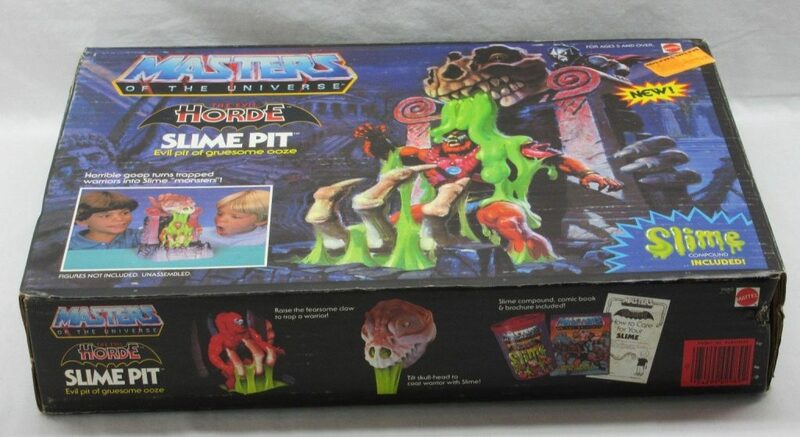 The Slime Pit was a clever way for Mattel to integrate its popular slime products into the world of Masters of the Universe. 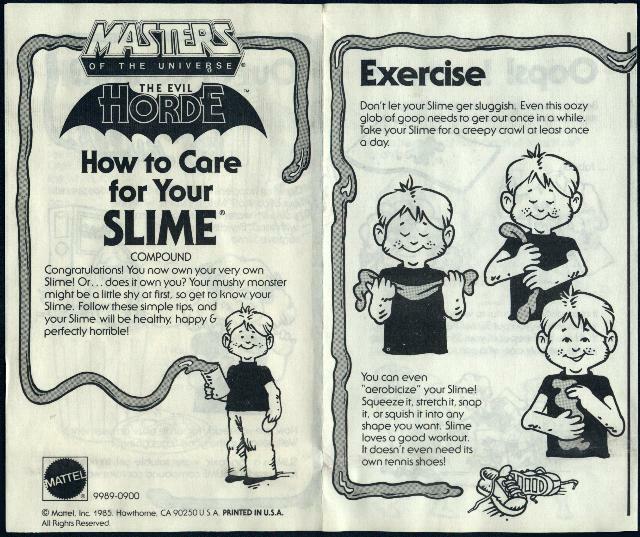 There is also some great information about slime in this article at Plaid Stallions and again in this piece by Dinosaur Dracula. 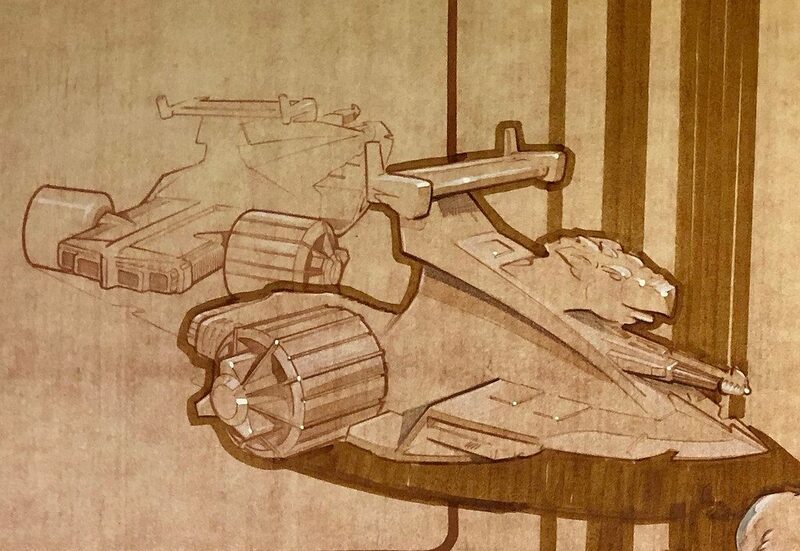 The final play set has a deeper pit area than the concept version. 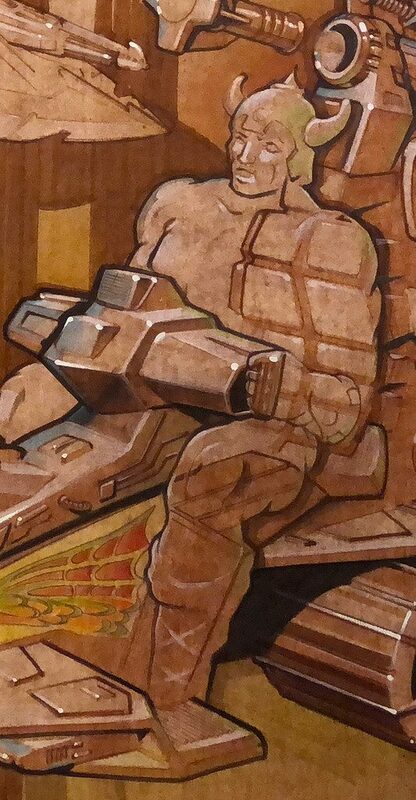 The paint applications are fairly simple, but it does have some well executed red and gray overspray on the gray stone areas and some brown overspray on the skull. 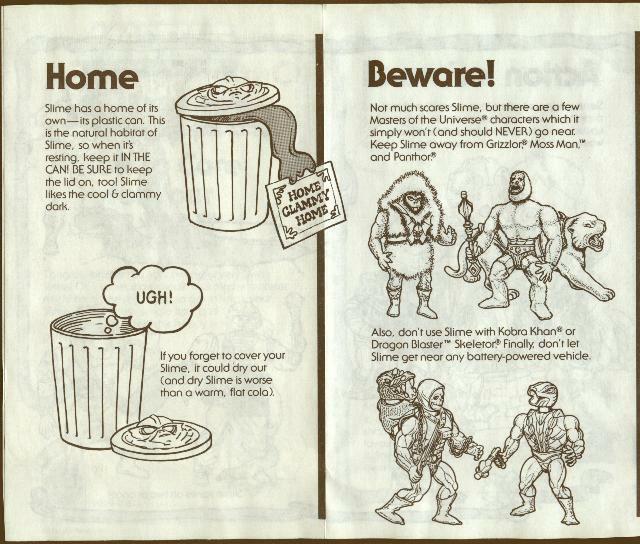 These seem more well thought-out than the often haphazard looking paint applications given to the exterior of Castle Grayskull (particular later releases of the playset). 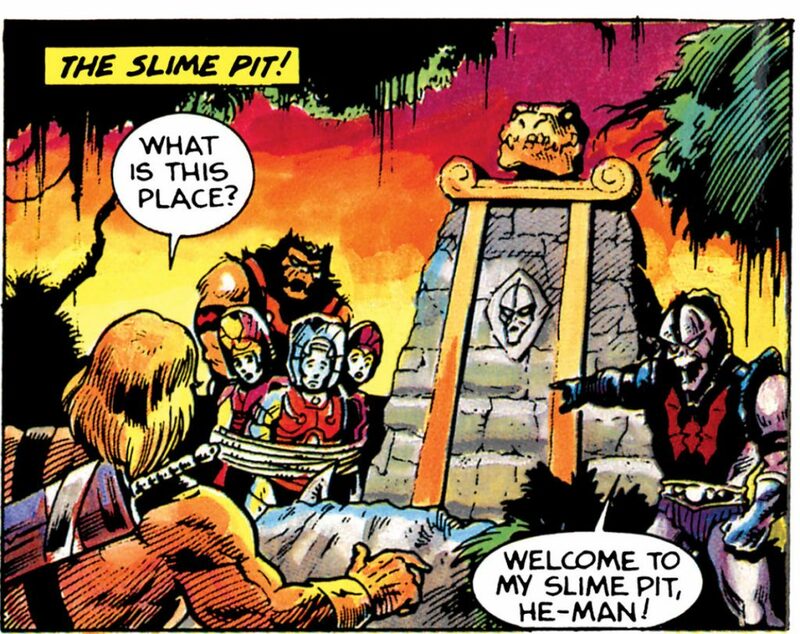 Like the Fright Zone, the Slime Pit is adorned with Hordak’s visage (Hordak seems really into branding his image on all things Horde). 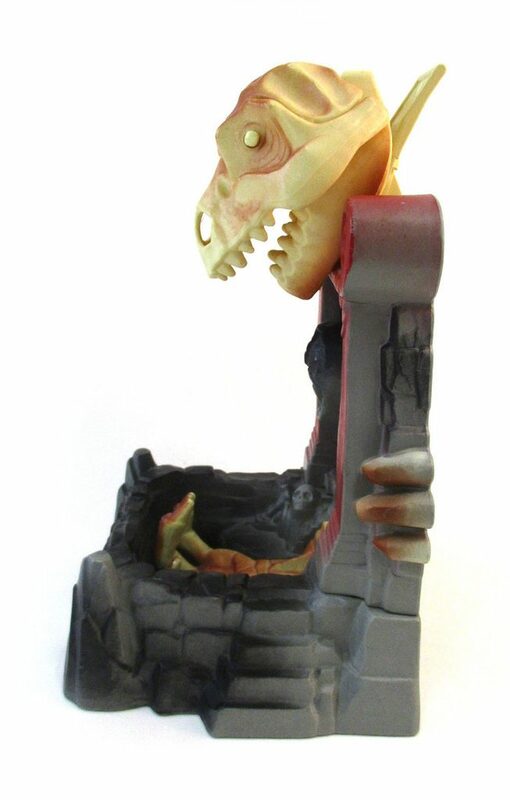 There is also a sculpted skull near the back wall. 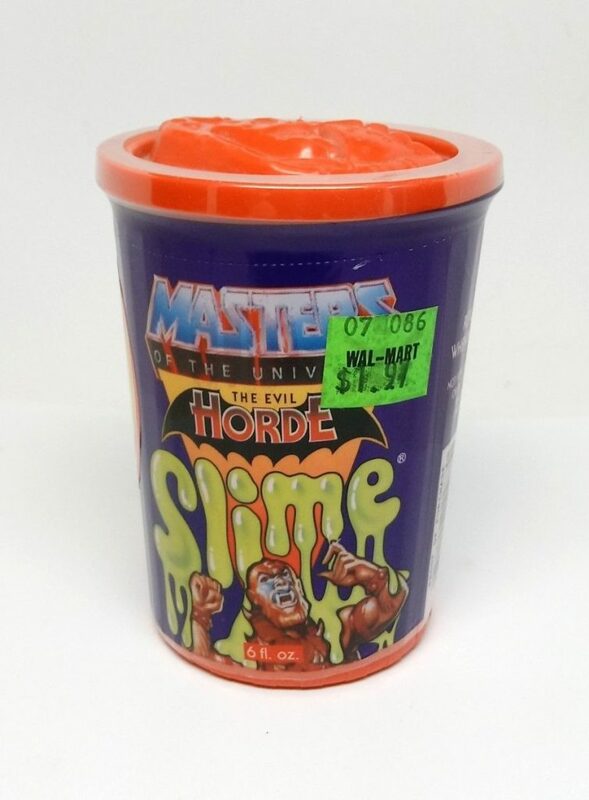 The playset came with a can of Mattel’s Horde Slime. 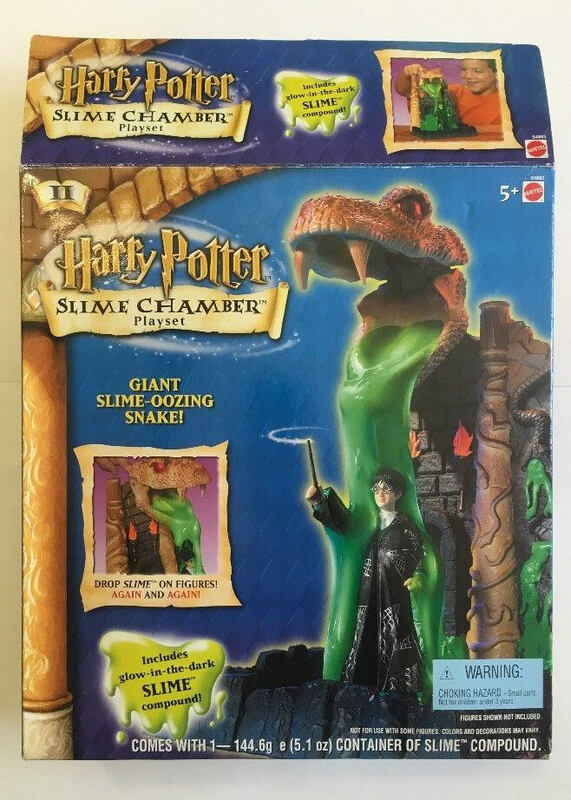 This particular slime mix was much runnier than the kind of slime typically found on toy store shelves today. 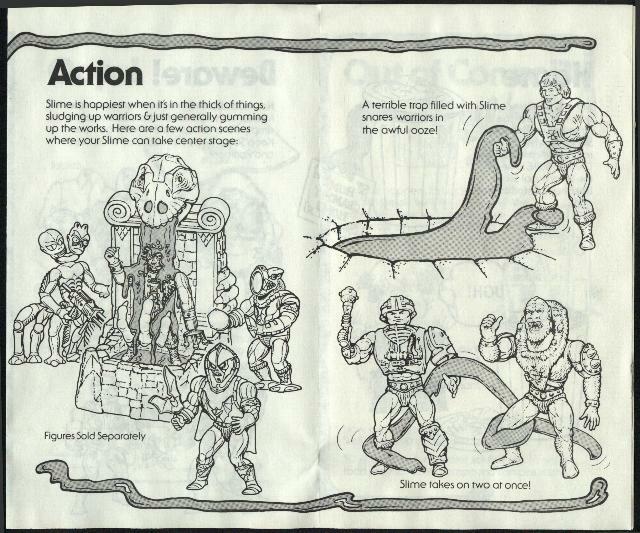 It was also available for free, separate from the playset, with the purchase of two action figures. 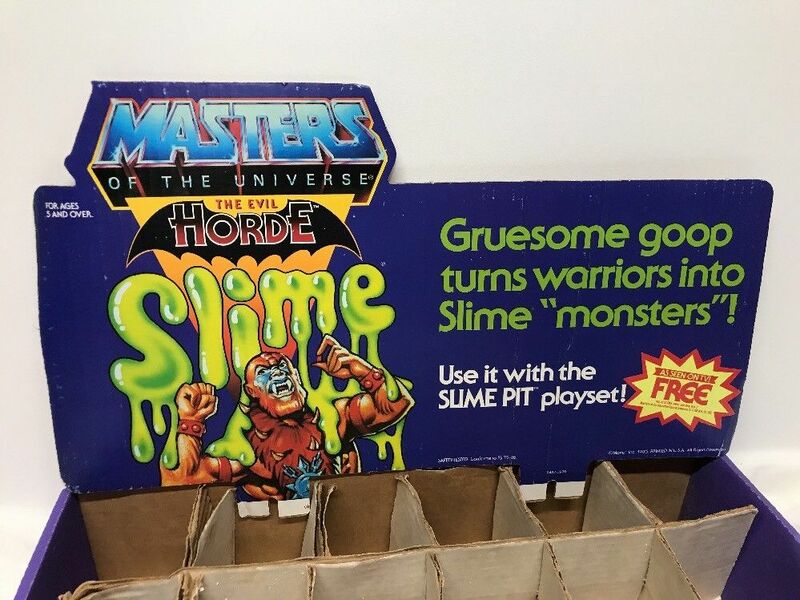 That runniness made it work great for the purposes of sliming action figures, but it also made it hazardous to rugs and upholstery, not to mention any furry MOTU figures like Moss Man, Panthor and Grizzlor. 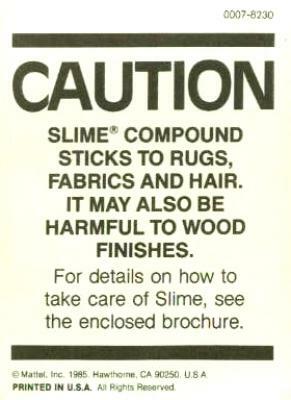 For that reason, there were a few warnings given about what not to do with the slime, which were of course promptly ignored by many enterprising young mad scientists. 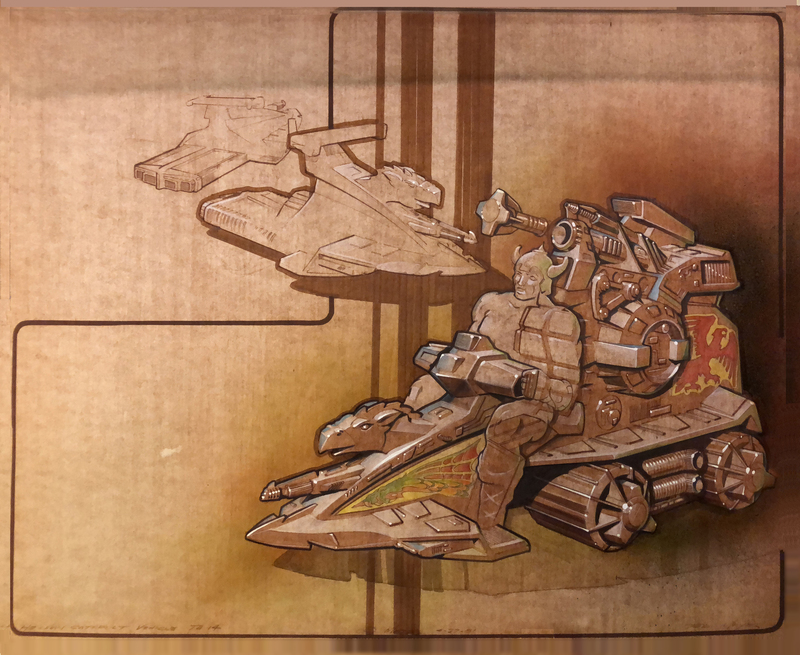 The box art was painted by the late, great William George. 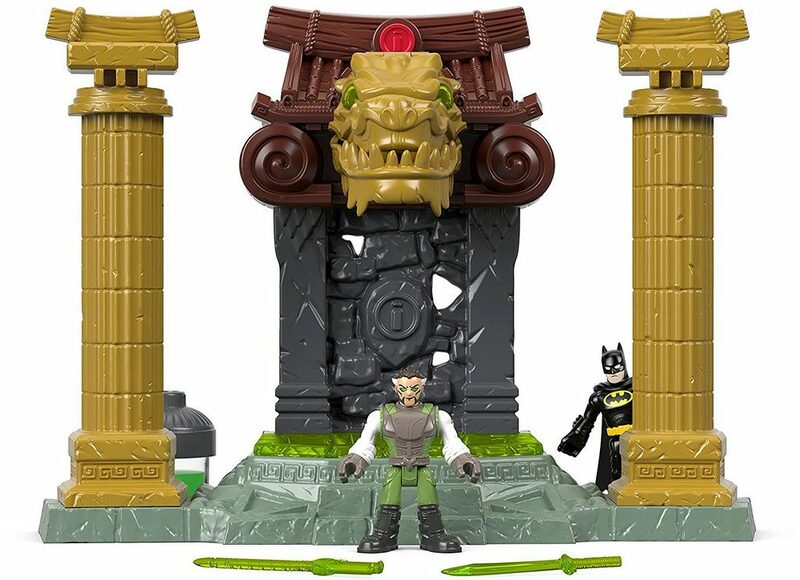 Taking cues from the design of the playset itself, the scene is set in ancient Greco-Eternian ruins. 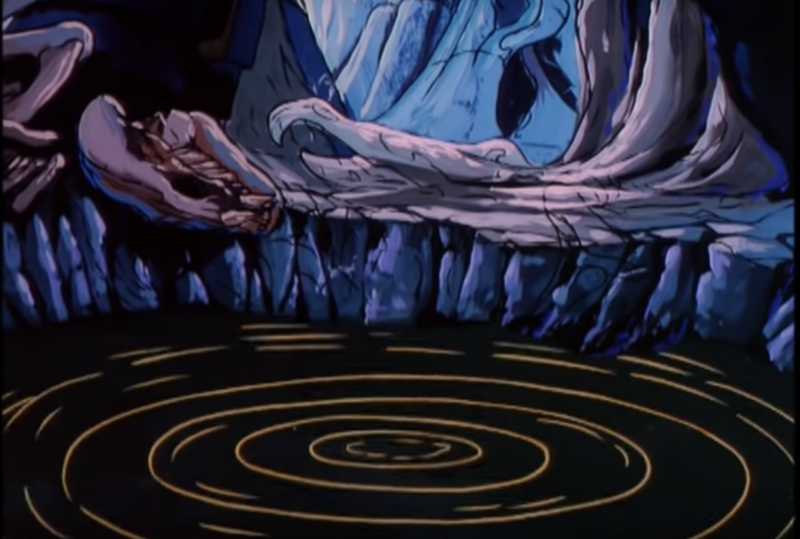 The Slime Pit appears in the She-Ra episode, “Loo-Kee’s Sweetie.” It doesn’t really look like the playset, but it does feature slime and a number of dinosaur-like bones. 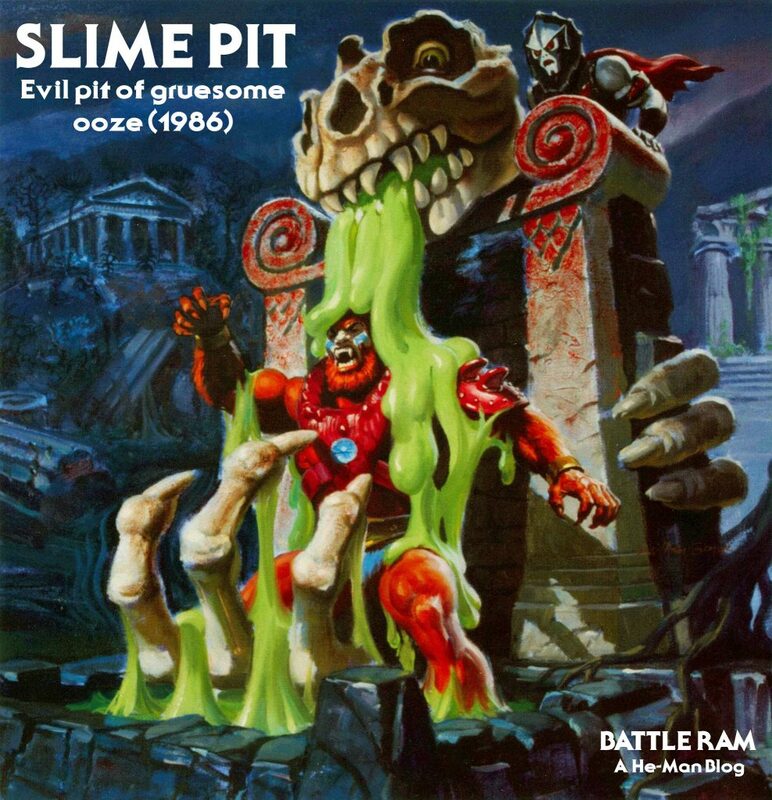 In the story, the Slime Pit saps its victims’ strength rather than turning them into zombie slaves. 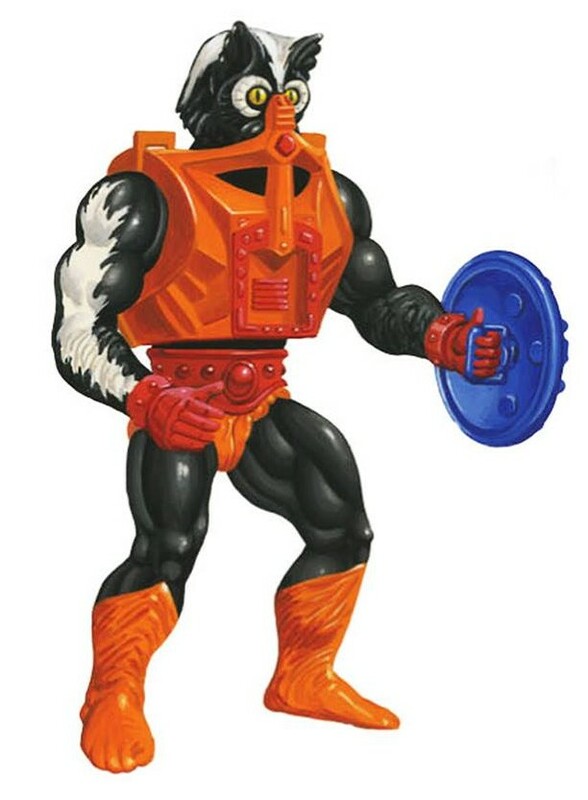 It’s easy to see why this less disturbing concept might be preferred for the purposes of an animated kids’ show. 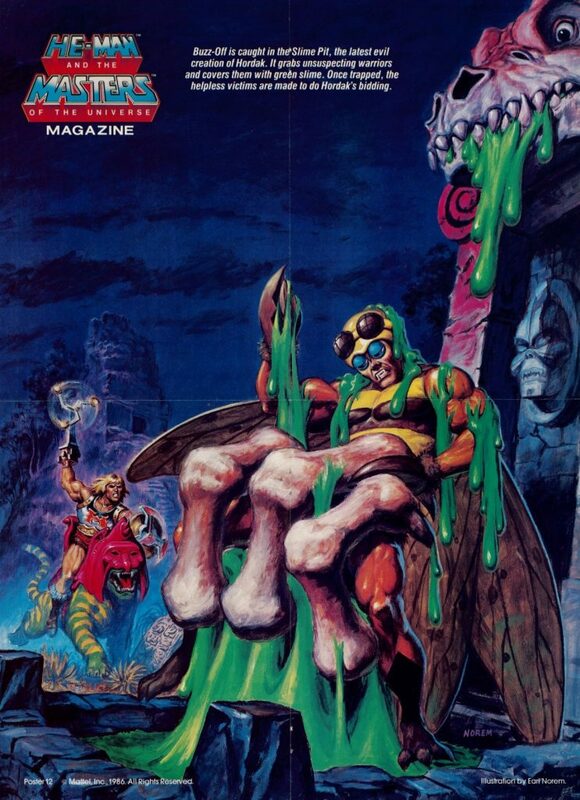 The Slime Pit was featured in the June 1986 edition of Masters of the Universe Magazine, as both the cover subject and as a poster by Earl Norem. 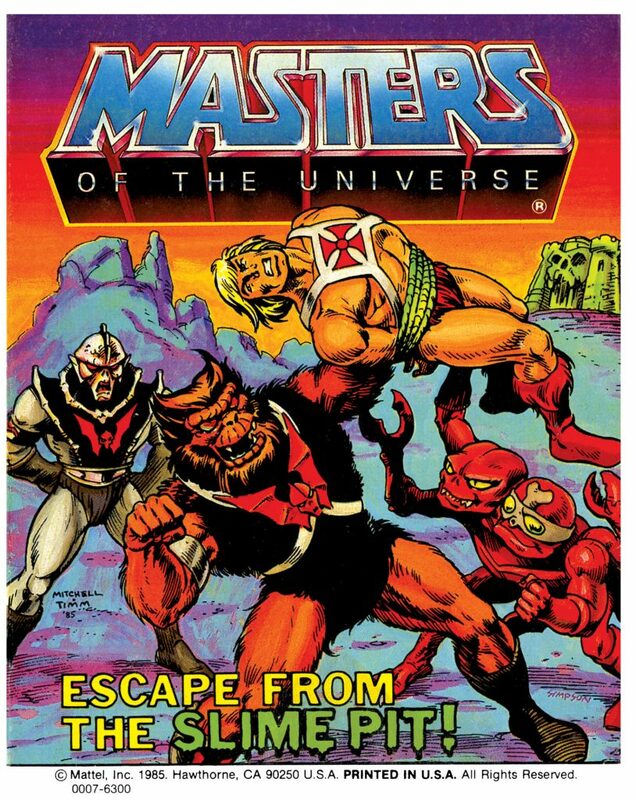 The artwork features Buzz-Off as the victim and Flying Fists He-Man riding to the rescue on Battle Cat. 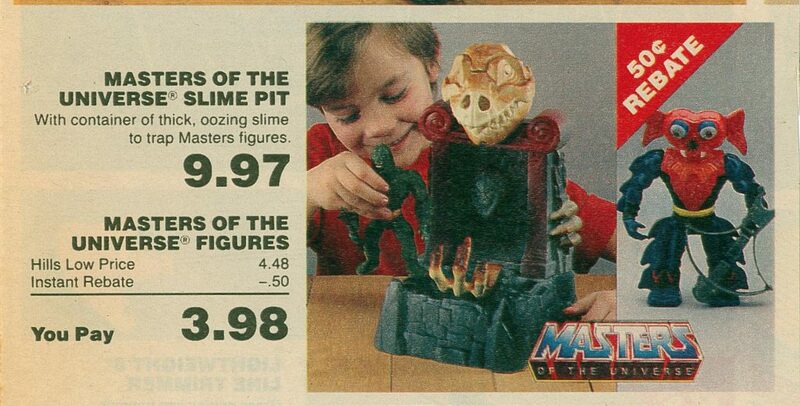 Imaginext Ooze Pit, very closely modeled on the original Slime Pit. 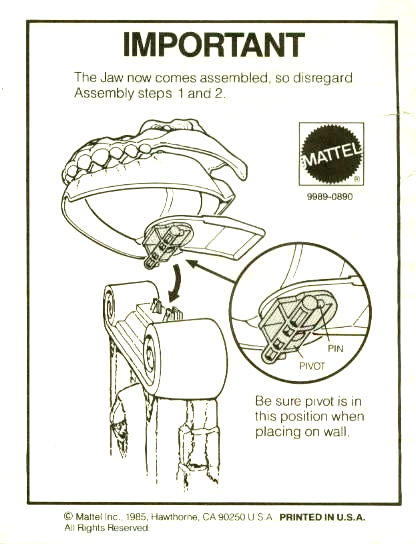 Wouldn’t you know it, in my second and “final” Super7 Wish List, there was one more thing I neglected to mention. One of my biggest wants in fact. 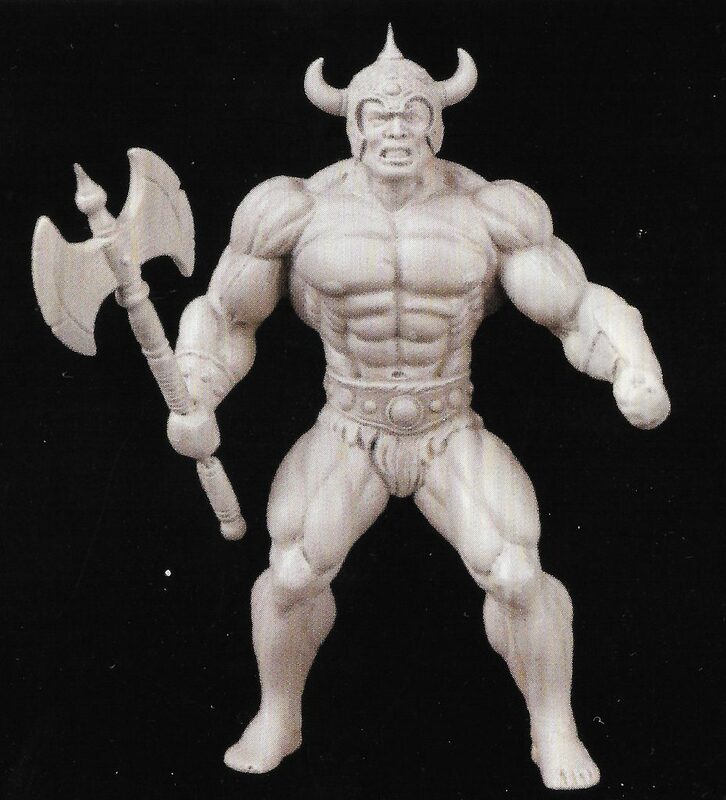 I’d really love to see 5.75″ scale figures based off the vintage cross sell art. 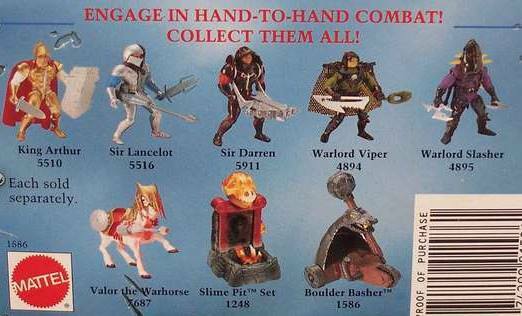 I did cover a few of these, where they happened to coincide with early prototype designs. 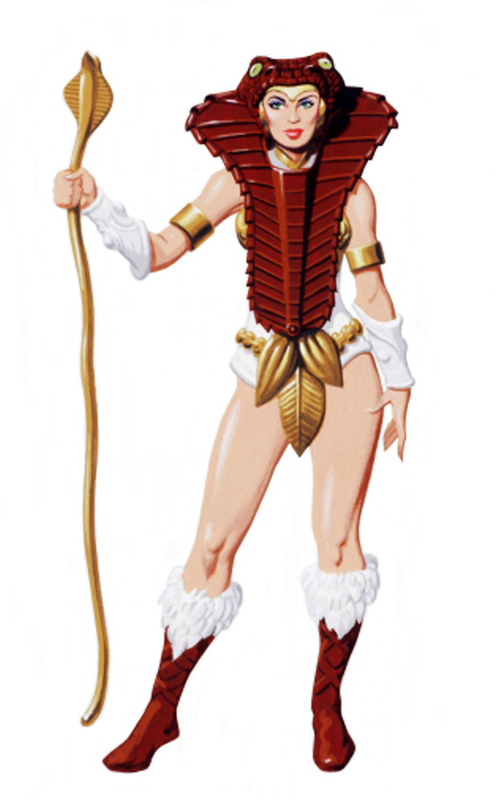 But there are a few more cross sell-based designs I’d like to see. 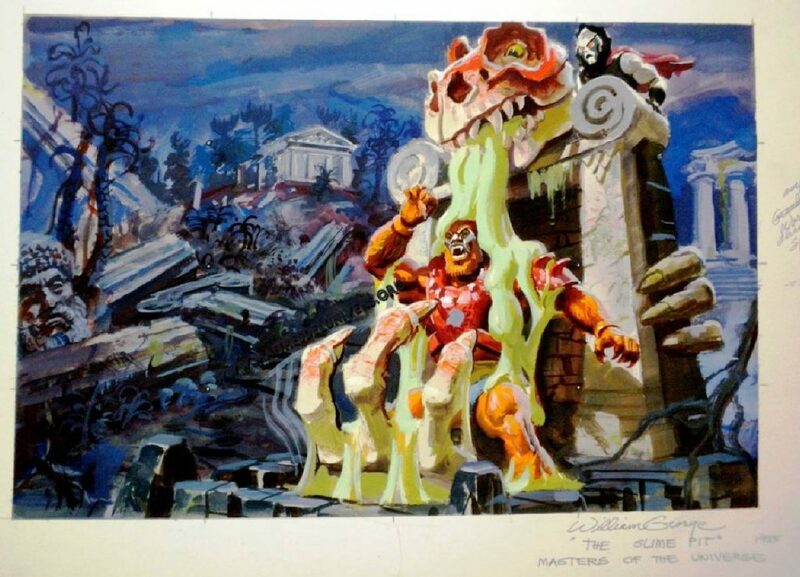 Envisioned and created by Mark Taylor Castle Grayskull is, both literally and metaphorically, the foundation stone of the world of the Masters of the Universe. 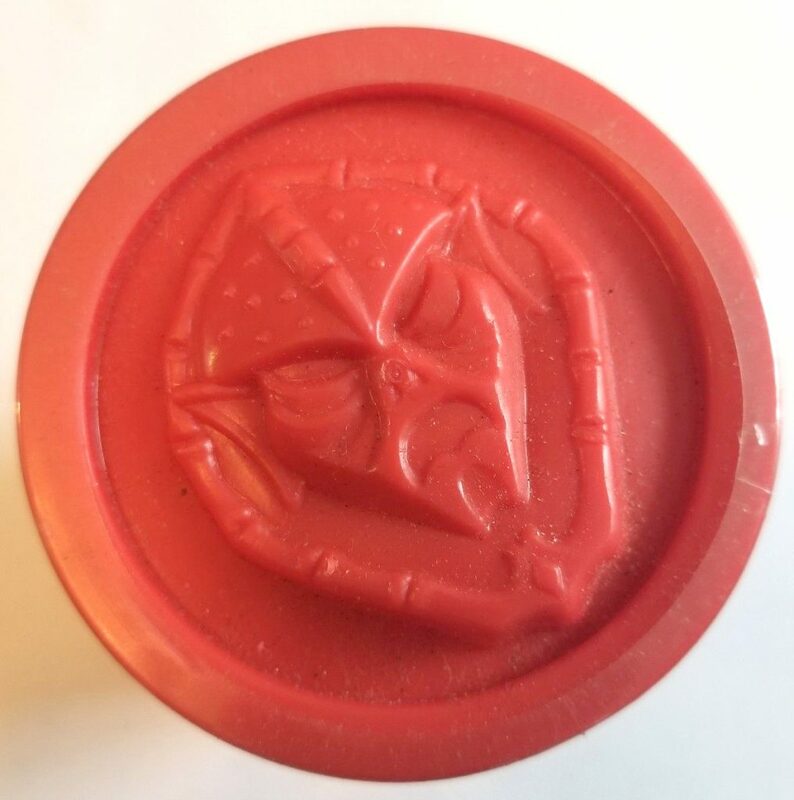 Like an archetypal image, it has grown from a child’s toy to become an iconic symbol in both pop culture and in superhero mythology of our modern time. 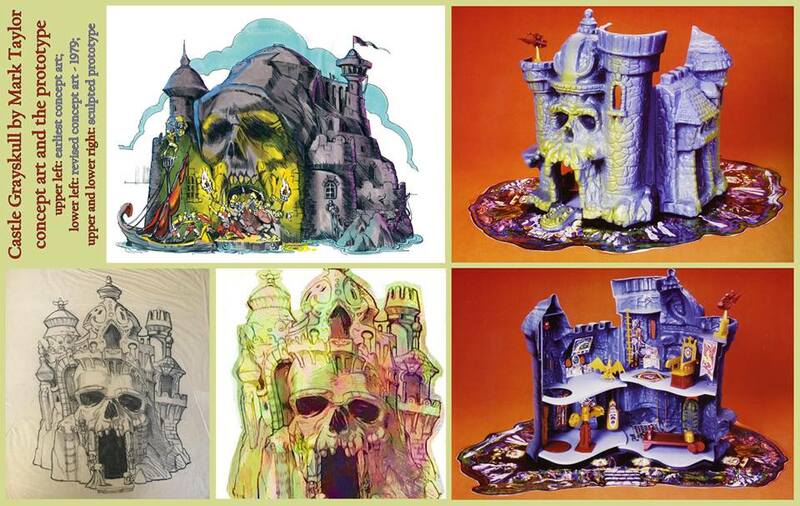 The concept of Castle Grayskull began with a fantasy drawing by Mark Taylor made even before he was employed in Mattel (sometime about 1975 – the picture on the upper left). 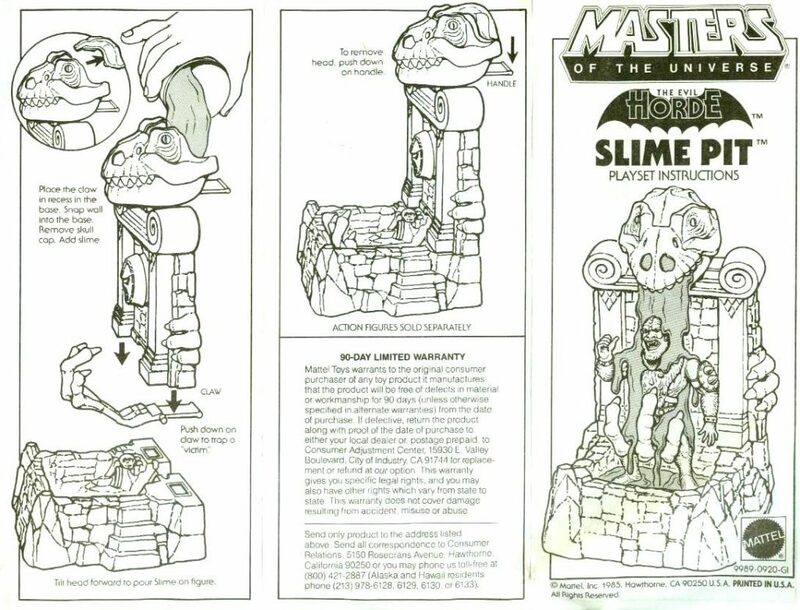 Later, working as a toy designer in 1979., he did a revised castle illustration (the lower left picture). 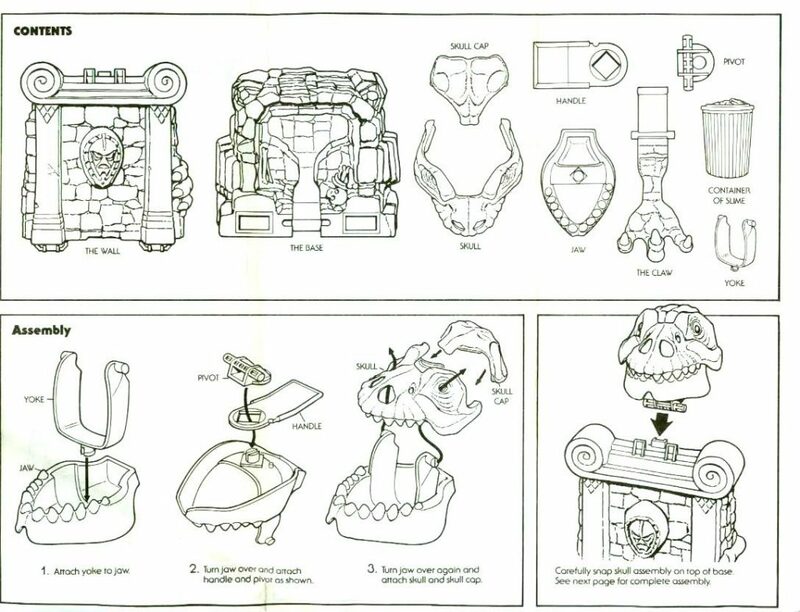 It went through many changes and revisions, again and again, until finally Mark sculpted the prototype castle (with a little help of Ted Mayer) based on the latest revised design (two images on the right show the prototype design). All through the design process, Mark insisted on the ancient, eldritch outlook of the Castle, invoking an atmosphere and image of a place that withholds secrets from beyond time and space, and setting it apart from yet another mythical magical castle. 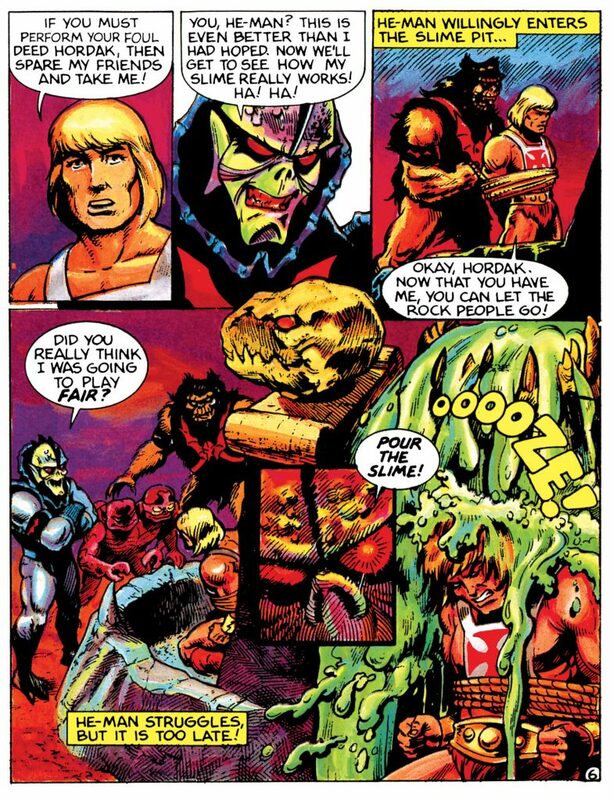 “I wanted it to be organic, it has to look like it weights, like it’s heavy, has a lot of weight to it… like it’s starting to melt”, describes Mark Taylor during a panel on Grayskull Con in 2013. 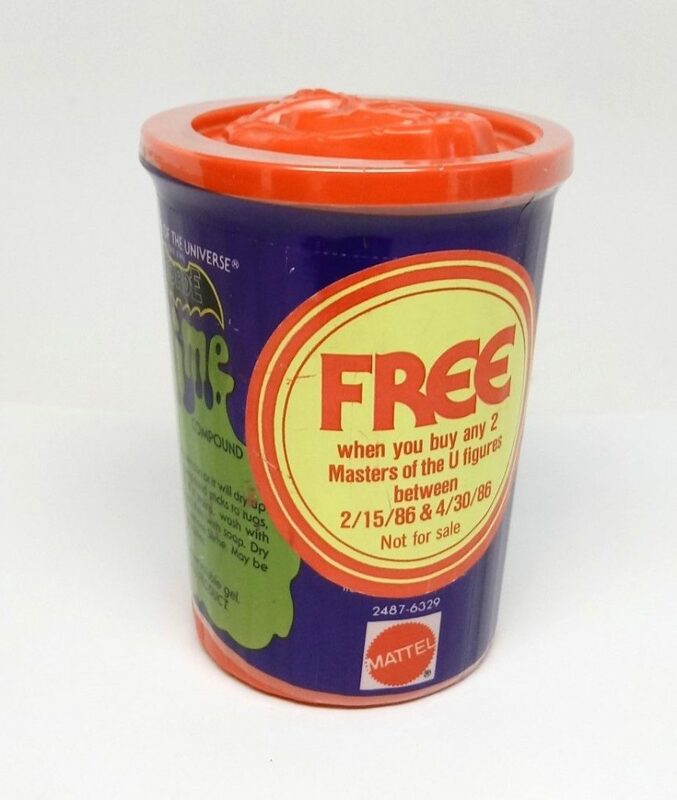 The Castle was made before any of the toy figures and all through the eighties (and in some world countries the nineties), it undoubtedly became one of the most iconic, most popular and well known play-sets for children across the world. 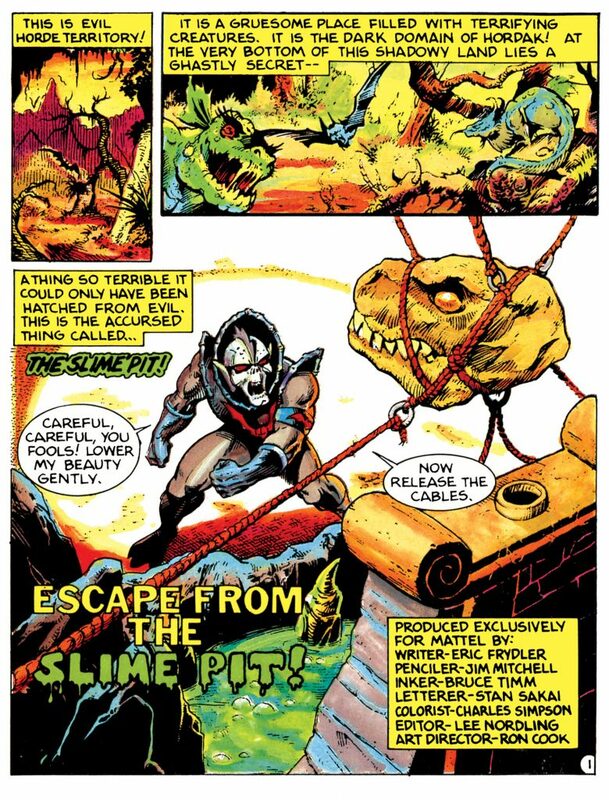 Starting from the original story concept, Castle Grayskull was the connection/conflict point of the hero He-Man and the villain Skeletor; and this concept was stretched to all the later incarnations of MOTU – the castle is always the ultimate fortress that Skeletor wants to conquer and claim its mystic powers. 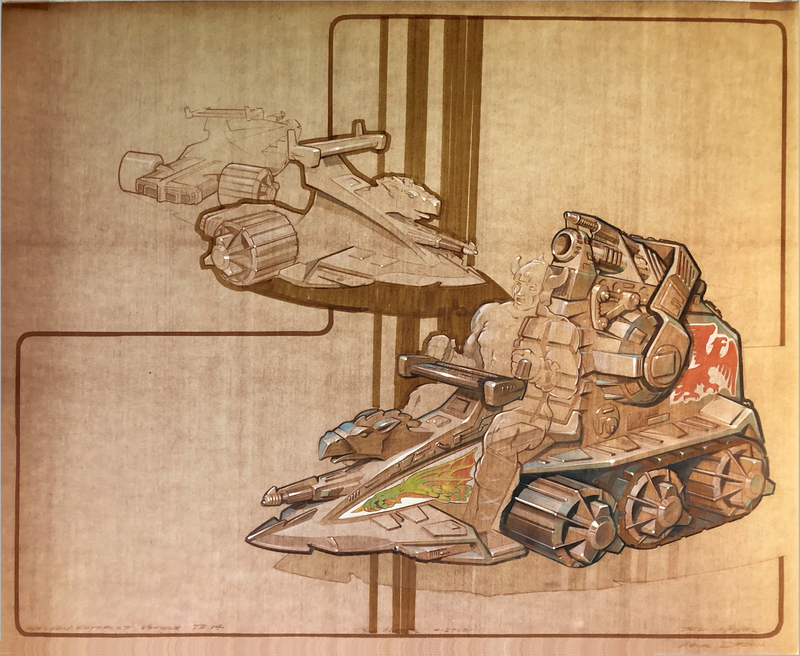 Another concept, started by Mark, that will remain a constant element common to all MOTU canons and story versions, is the concept that the ultimate Power is within Grayskull. 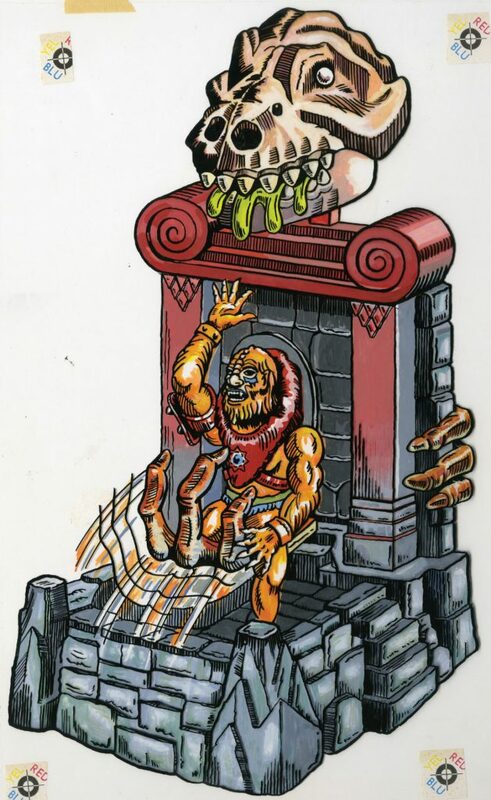 Besides the idea of a traditional scary medieval castle, Mark mentions several other sources of inspiration for Castle Grayskull, among which are the works of Mark Twain, the 1933 “King Kong” movie (specifically the Skull Island), as well as other places that are skull-associated or shaped. 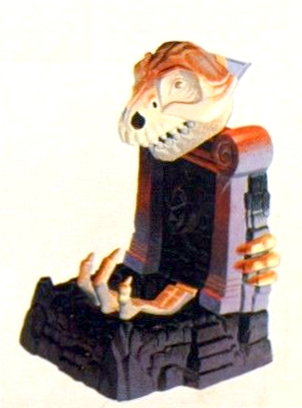 Evidently, most of these inspiration sources seem to rely on the symbol of the skull. This symbol is as ancient and old as humanity itself, and it is a very complex one. 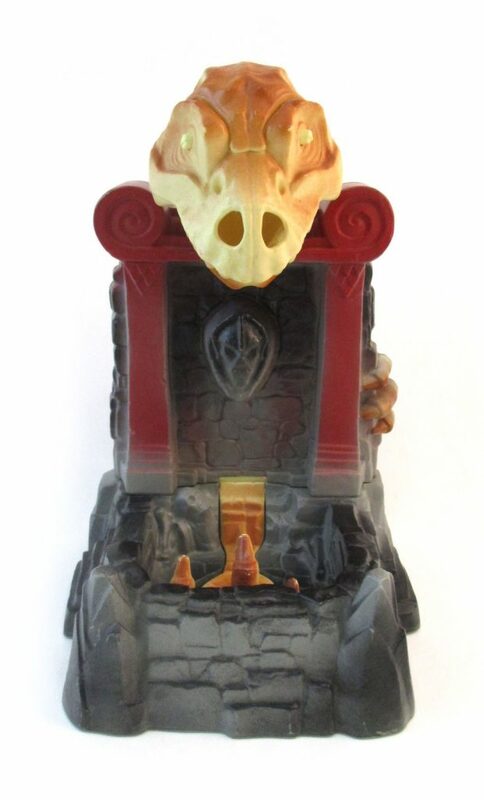 Though the most common symbolic use of the skull is as a representation of death and mortality, to some ancient societies it is believed to have had the opposite association – objects like crystal skulls represent “life”, the honoring of humanity in the flesh and the embodiment of consciousness. 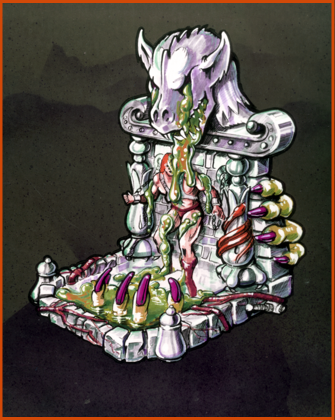 Thus, it can be viewed as a symbol of extreme polarities of life and death. 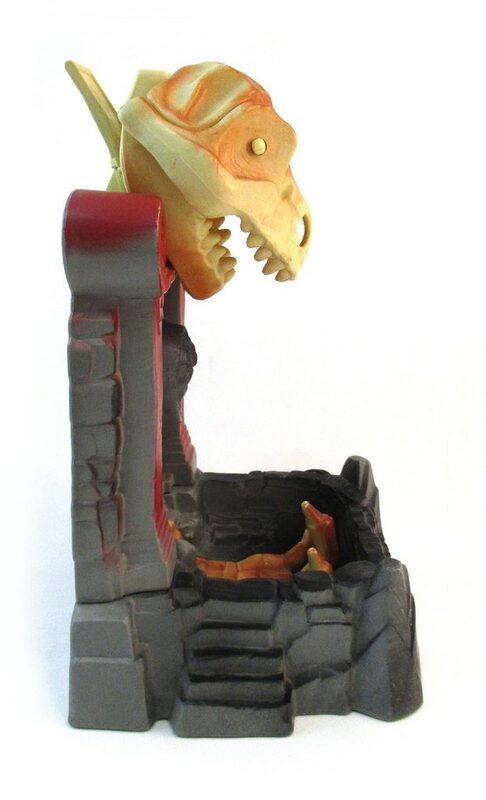 Mark Taylor’s Castle Grayskull is a masterpiece that has outgrown the concept of a child’s toy; it served and still serves many purposes on many different levels. 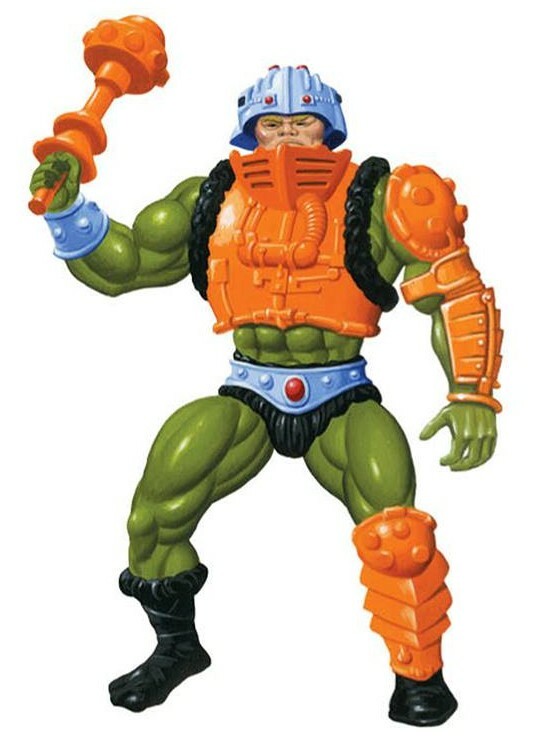 At the time of the genesis of MOTU line, it was a big turning point for the brand. 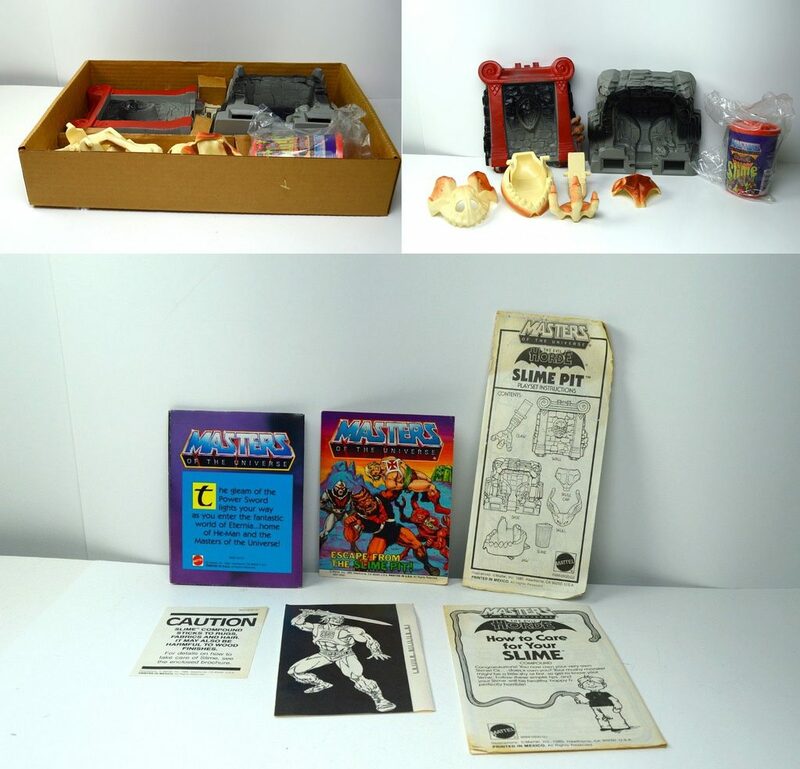 The Castle, together with wave one toys, not only set the specific mysterious feel of the MOTU setting, but was also crucial in the successful launching of the brand, as it became one of the most famous, most recognized play-sets for children across the globe. 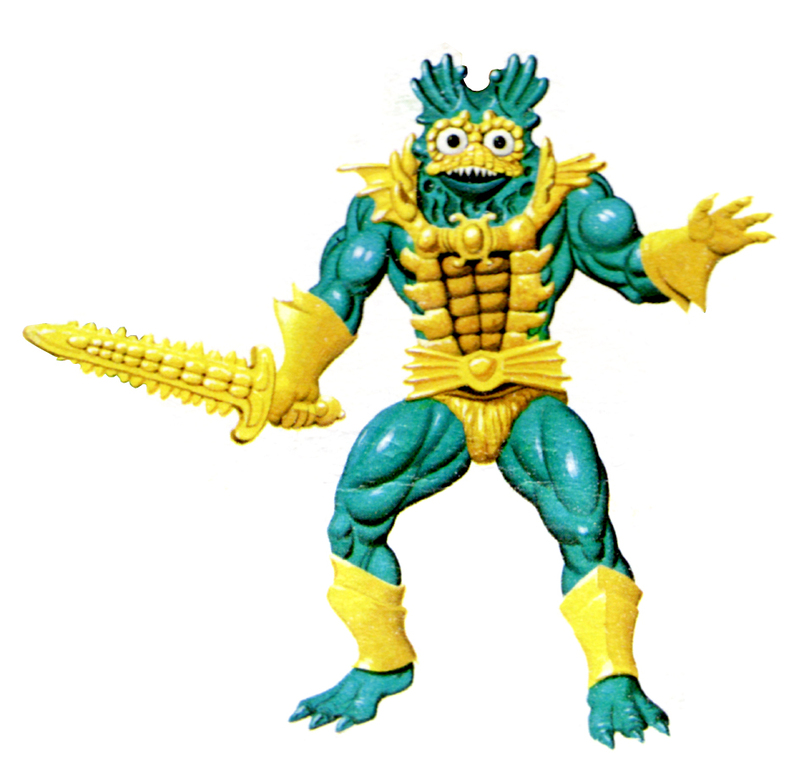 From the perspective of Mark Taylor’s world of MOTU, it is one of the main elements that started the whole story. 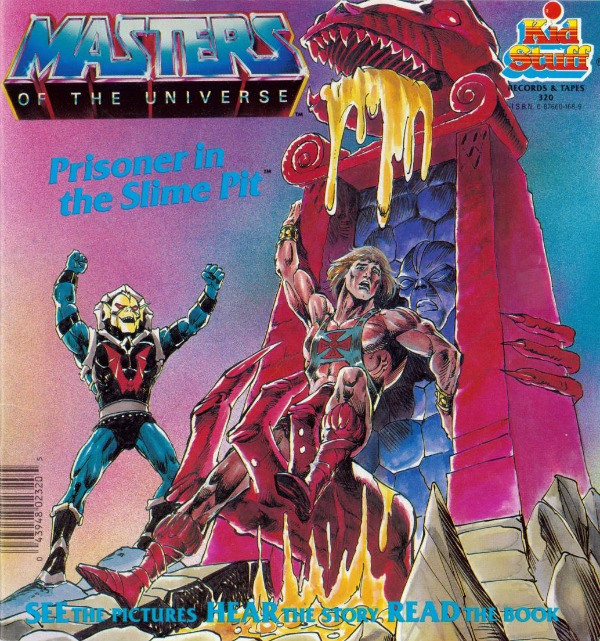 The Castle was where all the power lay for He-Man and Skeletor. 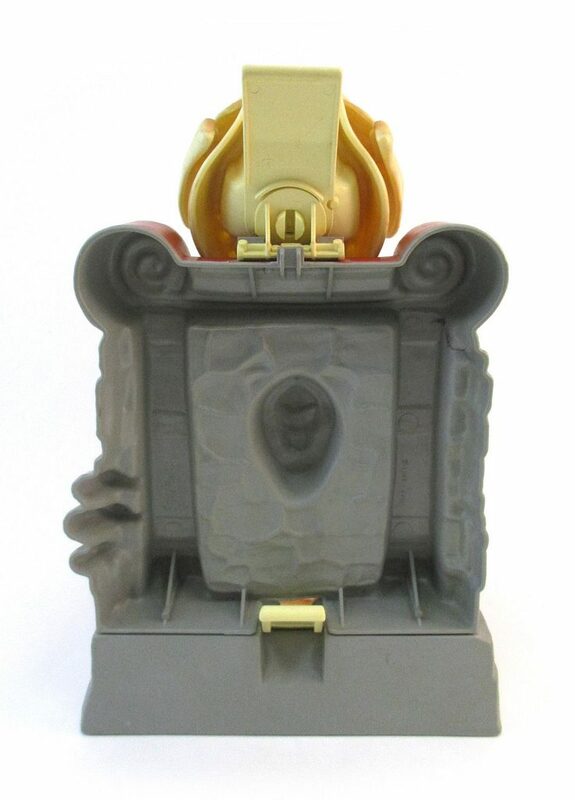 Whoever controlled Castle Grayskull, had access to the Well of Souls and basically controlled all of the power. 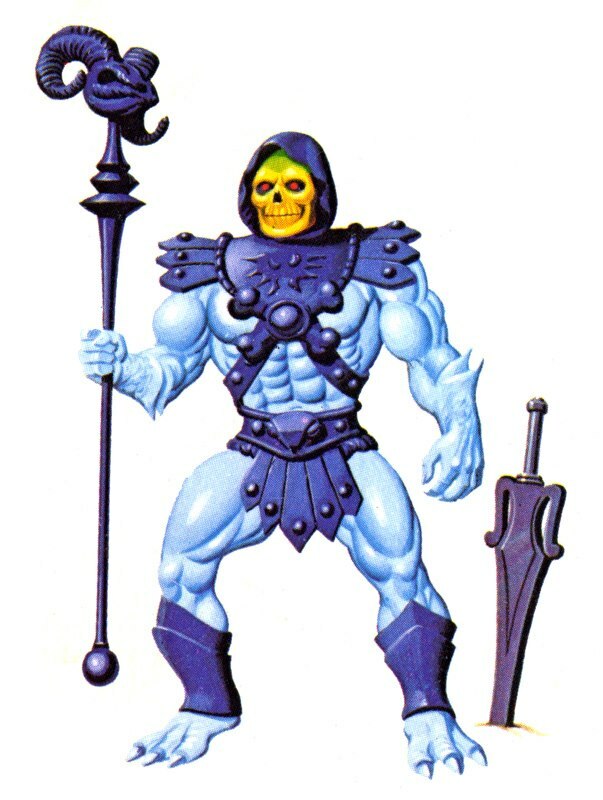 Finally, in the terms of our modern mythology analysis, I believe it is a complex symbol that represents the battle for dominance of the forces of life (as well as hope and courage, represented by He-Man) and the forces of death (including fear and dread – incarnated as Skeletor) in an ever-present, ongoing struggle. This battle of life and death, survival and demise, creation and destruction, is set in our collective subconscious – a universal experience known to all of us; and it is always shrouded in mystery because it is always challenging and ever-changing, demanding our constant adaptation and creativity. 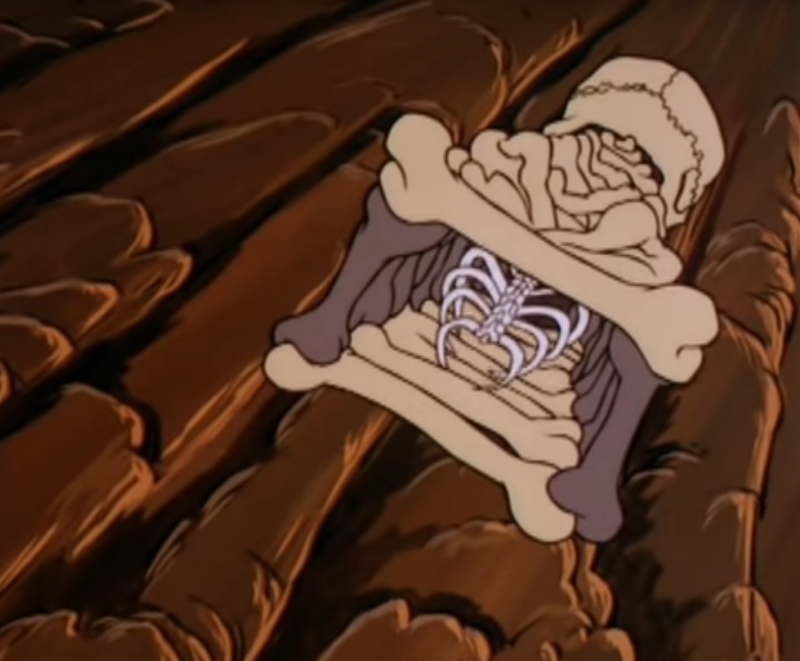 This is how the myth of Castle Grayskull speaks to both the grown up and the child in us, allowing us to relate to the existential battle of the hero and the villain, a battle we have fought and will fight till the end of days. 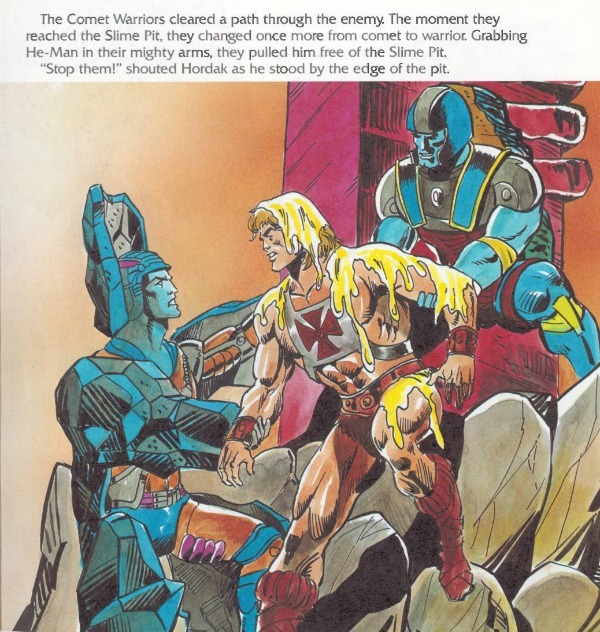 I wish to express my gratitude to Rebecca Salari Taylor and Mark Taylor for being willing to help and to reveal and share the information on the original Castle Grayskull with us. 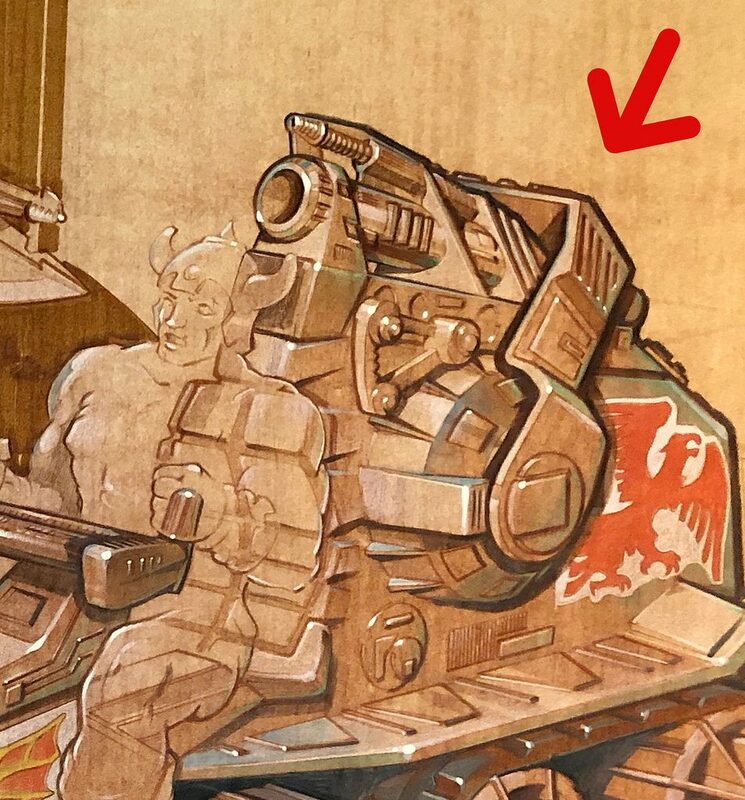 Also, I would like to express my thanks to my friends Jukka Issakainen and Adam McCombs in providing help and information in writing this post.